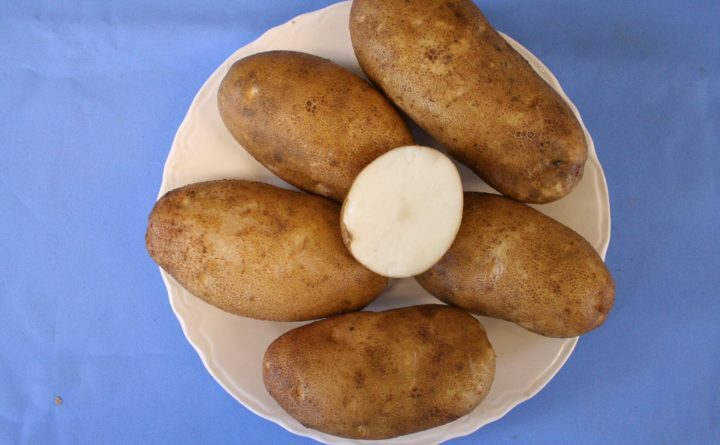 The Maine Potato Board has announced that the popular Caribou russet potato will be used in two restaurants in Bangor starting with high school basketball tournament week. Geaghan’s Pub and Craft Brewery will use the spud in a variety of potato-based dishes, and Hops House 99, inside Hollywood Casino, will use it to make hand-cut fries. Both restaurants are across the street from the Cross Insurance Center, which also serves the Caribou russet at its own concession stands. Geaghan’s plans to use the Caribou russet in dishes like Irish nachos, mashed potatoes, shepherd’s pie and potato-based stews. Hops House 99 will create hand-cut fries to accompany the variety of burgers and sandwiches on the menu. Both restaurants plan to continue using the Caribou russet until the supply runs out, which should be around mid-spring. The Caribou russet hit store shelves with limited supply in 2016. A year later, Hannaford stores began stocking the new variety in its produce sections throughout Maine. This year, more Hannaford stores are carrying the variety, as well as Stop & Shop stores, making it widely available throughout New England. This was originally published in the Fiddlehead Focus.